Just like ruffles and high-waisted jeans before, me and anything vaguely 'dungaree' have never really seen eye to eye. I've bought several dresses over the years and a full set of black denim dungarees, only to sell them a few weeks later with the tags still attached. I don't know what it is - maybe the toddler connotations or maybe I've just never got them to fit properly perhaps? It's a mystery. So, recently, for no reason other than the model looked nice in them, I decided to venture once again into the world of dungarees. I figured maybe the slit detail at the front will make me feel less frumpy, it's more pulled in at the waist than most styles and it's a nice shade of vintage denim. You could team it with a breton, I told myself, you like a good breton don't you? I certainly do so maybe I could? Well, dear readers, here we are today. 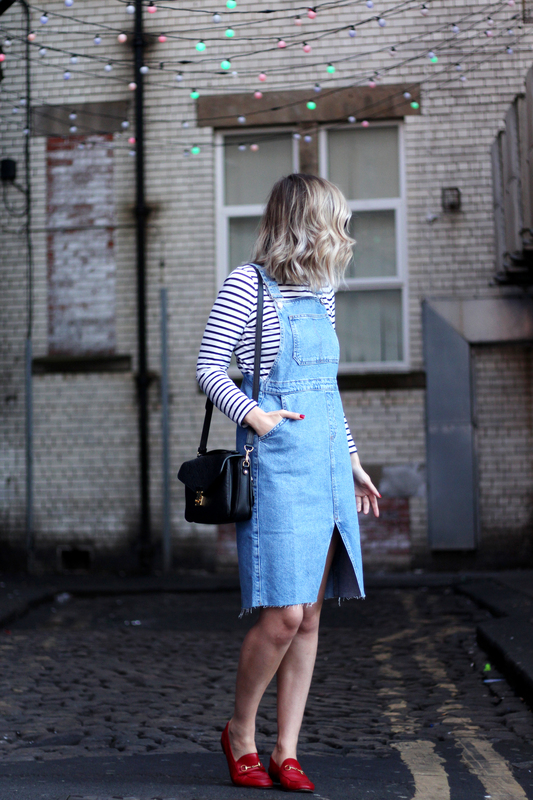 I actually really like this dungaree dress. I would say size down if you can because the denim is quite roomy (and stretchy!) but if you have wide hips, then take your usual size. This dress would go with a bunch of tops and knitwear in my wardrobe and I love the length too, so I think I'm onto a winner here guys. Sometimes it takes years to find the style you've been looking for and that's ok.